Centrally located in Coolangatta, close to shops and restaurants, the Resort overlooks both Coolangatta and Greenmount beaches. Coolangatta Beach offers the perfect destination to enjoy the laid-back beach lifestyle and rejuvenate in comfortable surrounds. Located opposite the beach, Coolangatta Beach offers deluxe one, two and three-bedroom apartments, most with spectacular views to Kirra, Greenmount and Rainbow Bay. Leisure facilities at Coolangatta Beach include a heated swimming pool, spa, sauna, exercise room and tennis court. Beachfront restaurants, cafés and shopping are just a short stroll away, and guests are also within easy reach of attractions such as Currumbin Wildlife Sanctuary and Catch-a-Crab tours at Bilambil. 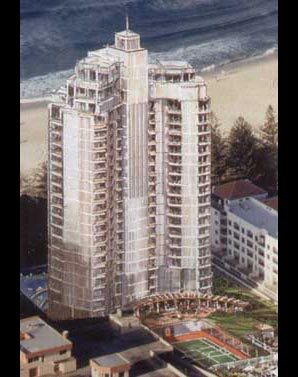 Coolangatta Beach, Coolangatta offers 88 deluxe one, two and three bedroom suites over 18 levels, most with spectacular ocean views. All apartments feature air conditioning and balconies. Available with 1 queen + 1 sofa bed. Features full kitchen and laundry facilities. Available with 1 queen + 2 singles + 1 sofa bed. Features full kitchen facilities, laundry facilities and a bathtub. Available with 1 queen + 4 singles + 1 sofa bed. Features full kitchen and laundry facilities. Coolangatta Beach is perfectly located opposite the stunning Coolangatta Beach, with spectacular views to Kirra, Greenmount and Rainbow Bay. 88 Marine Parade, Coolangatta, Queensland. 4225 Australia.